Discover the Healthy Eating Secrets You Can Use to Lose Weight & Feel Better Than You Have in Years … Without Starving Yourself or Giving Up Your Favorite Foods! How to evaluate your current diet – answer these seven questions and you’ll know exactly how you are currently doing as well as what you need to change to begin eating healthier! What exactly a healthy diet is and how to eliminate your fast food cravings and ensure you’ll continue to eat healthy from here on out – you’ll be amazed at how easy it is to make healthy food choices when you follow these simple tips! One of the biggest keys to developing a healthy diet and sticking to it – you may be very surprised at what you read here! 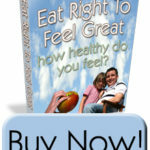 Why the saying, “you are what you eat” couldn’t be more true – find out why these five words are words to live by here! How foods work together – and how to use this information to create well-rounded meals that will start boosting your health and energy in no time! 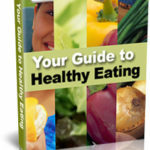 How to plan healthy meals – planning healthy meals can be difficult, especially if you are cooking for a family who is stuck in a rut of unhealthy meals … however, read this important information and you’ll soon be able to have your family eating healthy without them really even realizing it! The key to ensuring that you and your family eat healthy meals – plus, how to get your family involved in the preparation of healthy meals … it’s much easier than you think! How to stock your kitchen to ensure you continue to eat healthy and lose weight – plus, healthy eating tips for when you eat out! How to cut through all the diet misinformation that’s out there and focus on the tried and true tips that are guaranteed to help you lose weight – as well as improve your health faster than you ever thought possible! The ABCs of nutrition – learn this info and you’ll always be able to make the healthiest food choices at a meal! And much, much more – this ebook even includes tasty, “healthy,” easy-to-make recipes that you can start using immediately!